I like to read history books. My college education gave me the great gift of learning to read and appreciate and enjoy “boring” books. I don’t do it as often as I would like, but when I’m not too busy, too tired or too lazy to pick up a good non-fiction, non-theological/devotional book, I love reading history. Specifically American history (although, as you’ve seen, Irish history always piques my interest). My favorite professor in undergrad gave us the opportunity (actually, he forced us) to read good American historians who took and take their jobs seriously enough to not give in to political bandwagons or patriotic fairytale-isms. I appreciate authors and researchers who guard against their own biases. David Hackett Fischer. I’ve read a number of his books, and can whole-heartedly recommend them. Sometimes you forget you’re reading non-fiction. Paul Revere’s Ride. This was one of the first books I read in college, and it changed the way I felt about history classes and their “textbooks.” So worth it. Washington’s Crossing. Another early read, and once again, very worth it. Champlain’s Dream. This one is my favorite (probably of any historical books), hands down. I read it after graduation upon the recommendation of my aforementioned favorite professor, and wow. Just wow. I never enjoyed the history of exploration until this book. Joseph Ellis. For writing style, I think Ellis is my favorite. He has a very personal and engaging tone in his books that makes whatever he’s writing about interesting. Founding Brothers. This book is amazing!! Basically, it’s a compilation of true short stories about various founding fathers, like the duel between Hamilton and Burr (got milk?). His Excellency. A biography of George Washington. I’ve not read other biographies of Washington, but Ellis just has a funny and fair way with words that makes me fairly confident this would be my favorite. American Sphinx. A biography of Jefferson. Full disclosure: I’m only sixty pages in. But so far, it’s great. I love Ellis’ candor and sense of humor. It just seems that they loved literacy, words, and writing so much that they couldn’t help themselves but to embellish, creating some of the most famous and beautiful written works of literature. And when I say beautiful, I don’t mean well-structured sentences. I mean beautiful — like decorative. Go look up the famous “Chi-Rho” page in the Book of Kells. I thoroughly enjoy hearing about these funny, country scholar-monks going about their copy work with such gusto. I wish that I was always as enamored with the written word as they were. I’m slowly making progress in How the Irish Saved Civilization. Every time I pick it up I’m amazed and am more and more encouraged by what I read. I’ve written a summary below of some of the latest things I’ve learned. Saint Patrick’s influence through the ages, and the way that God used his spiritual descendants baffles and amazes me. The movement he started had impact that I doubt he ever imagined it would. A few generations after Patrick, a man named Columcille set off to start a monastery in Scotland. Pagan tribes had displaced Patrick’s Celtic relatives into Wales and Scotland, and, with the fall of Rome, illiterate paganism of the Germanic tribes was a threat to the intellectual foundations that had been built during the Roman rule. Columcille became a “white martyr” (red martyrs died, green martyrs studied in solitude in nature, and white martyrs “sailed into the white sky” as missionaries), and set up shop, with no intent to return to Ireland. He met with great success, and soon had to put a cap on the membership of his monastery. When they reached 150 monks, he would send off 13 men to start a new monastery — and so the Irish church plants began. The Irish monks began to minister to all of what is now England. And who better to minister to illiterate barbarian tribes than a group of monks whose faith and literacy was just generations old. Another Irish missionary was Columbanus, who was 20 years or so younger than Columcille. He took a group of monks to Gaul. He was a feisty man, from the sounds of it, challenging the stale leaders of the Catholic Church — reproving them for their reluctance to serve those outside of their comfortable cities and palaces. He was even deported, but when the boat on which he was deported sank, he and his men began to form monasteries in Italy. His passion was for the unreached barbarians, and he continued to start monasteries well into his seventies. It is largely because of his work that the European tribes heard the gospel. So think of this amazing circle of grace: The Greeks and Romans “civilize” and educate Europe. Through the ministry to the Celts in what is now Britain, Patrick is saved. Through slavery he is exposed to the tribes in Ireland, and eventually becomes a missionary, almost entirely responsible for their conversion. Rome falls and Europe returns to illiteracy and barbarism, with some exceptions. And God uses these believing Irish monks to convert the powerful Germanic tribes in the same areas that sent the men that would impact Saint Patrick’s people. Reaching from the boot of Italy, up into France and Norway, the Irish influence in the spread of Christianity and learning is almost incalculable. Now obviously, there’s more to this story, and the Irish don’t deserve all of the credit for the evangelizing of Europe. But it’s still impressive, when you think of the size of Ireland, and the few years between Saint Patrick and the sending of their missionaries, it’s amazing. Another amazing thing to think about is the effect of literacy on this culture. But I’ll have to tell you about that another time. When we got back from vacation in January and went back to work I had a hard time. As I was returning, everyone else was still on vacation, which made for a very long, and slow week. It was made even longer and slower by the fact that it was so cold outside that the facilities manager asked everyone to keep the shades closed (how cold does it have to get for that to happen? Oh, just about -20 degrees Fahrenheit). So it was a cold, lonely, dark, and boring week after I returned from the vacation of lifetime. In my state of deprivation of so many vital things (warmth, company, activity…), I was driven to seek out new pastimes to help me get through the more mindless parts of my job. And thus, an Audible addiction was born. I’ve been a fan of LibriVox.org for a few years now, listening to good books read by bad readers. And all for free! (Okay, I still heartily recommend LibriVox, I’ve just become a bit of a snob, I guess) And then I realized that on Audible.com you can buy much better quality audio books for cheap without even creating an account or starting a trial membership. All it takes is your Amazon account credentials (they are owned by Amazon), and by looking for books marked “special price,” you can get great books for great prices. I’ve been semi-addicted for just over a month, and I think I’ve just broken the $10 mark. I have yet to pay more than $3.99 for a book, and the cheapest was only $.99. I can’t remember the last time I’ve made it through that many books so quickly (because in addition to the books I’ve listened to, I’ve also read several hard-copy books), but with the amount of envelope stuffing and spreadsheet making I do, it’s been a wonderful way to multi-task. I’ve also used the books during painting projects and dinner prep as well. So if you can’t find time to read books but be willing to spend less than the cost of a latte on an audio book (that you can play on your phone and computer), I’d suggest that you try Audible.com — it’s awesome. Right now I’m working on finishing How the Irish Saved Civilization, and I’m loving it. I’ve started it once twice before. It’s an amazingly interesting book, and the only reason my first tries were unsuccessful were because I kept having to return it to the library. I highly recommend it. In fact you should just buy it right away, rather than have to deal with returning it to anyone. In the book, Cahill spends quite a lot of time talking about Saint Patrick, who, by all accounts, is a fascinating person even though there isn’t a lot known about him. What is known (mostly without question), is that he’s almost solely responsible from the conversion of the pagan Irish tribes to Christianity after being held as a slave for several years. He returned to Ireland to minister to the very people who had enslaved him. Here are some beautiful words that Cahill quotes, from what is known as Saint Patrick’s Breastplate*. Realizing the depth of the violent, pagan culture to which Patrick was ministering to, this prayer for protection is significant, as well as beautiful. 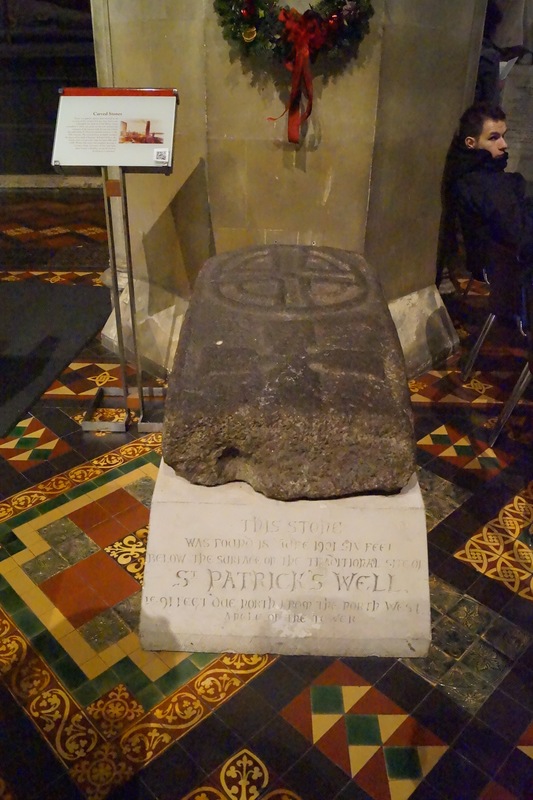 One of the stones found by the well Saint Patrick is thought to have baptized by. Saint Patrick’s Cathedral is built on the site of this well. “I arise today, Through a mighty strength, the invocation of the Trinity, Through belief in the threeness, Through confession of the oneness, Of the Creator of Creation. “I arise today Through God’s strength to pilot me; God’s might to uphold me, God’s wisdom to guide me, God’s eye to look before me, God’s ear to hear me, God’s word to speak for me, God’s hand to guard me, God’s way to lie before me, God’s shield to protect me, God’s host to save me From snares of devils, From temptations of vices, From everyone who shall wish me ill, Afar and anear, Alone and in multitude. I summon today all these powers between me and those evils, Against every cruel merciless power that may oppose my body and soul Against incantations of false prophets, Against black laws of pagandom, Against false laws of heretics, Against craft of idolatry, Against spells of witches and smiths and wizards, Against every knowledge that corrupts man’s body and soul. Christ to shield me today Against poison, against burning, Against drowning, against wounding, So that there may come to me abundance of reward. Christ with me, Christ before me, Christ behind me, Christ in me, Christ beneath me, Christ above me, Christ on my right, Christ on my left, Christ when I lie down, Christ when I sit down, Christ when I arise, Christ in the hear of every man who thinks of me, Christ in the mouth of everyone who speaks of me, Christ in every eye that sees me, Christ in every ear that hears me. I just love the thoroughness of these last few verses — his desire for protection from sin and evil, and the desire for nearness of Christ is inspiring and helpful to me. I want to show you a little more of Cahill’s work later, so look out for Part 2, coming soon! Built in the 1190s. Wow. I want to show you a little more of Cahill’s work later. Look out for Part 2 coming soon! *Saint Patrick’s Breastplate is thought to have been written by Patrick, and it is a widely accepted opinion, although it is not actually provable. At the very least though, Cahill says that it was inspired by him. During college I didn’t read very much fiction, and for the first few years after college I read books in threes — one theology/devotional, one history, and one fiction. But in the last few years I have had a so much less time to read that my reading list has been restricted, with theology taking the front seat, history in the back, and fiction all of the way back in the trunk. Jellicoe Road by Melina Marchetta. This book was unlike any other book that I’ve read before — it’s one of those books where you pick it up and can’t really figure out what the author is doing, but within 15 pages you’re utterly hooked. I think I read the first three chapters in one sitting, and then the entire rest of the book in the second. The pieces just fall together like a puzzle – you might not be able to figure out what it’s going to look like at the beginning, but at the end the pieces fit together perfectly. Dracula by Bram Stoker. I went into reading this book kicking and screaming. No part of me wanted to read about vampires, and I’m definitely not into horror stories. But this book is awesome. It’s not Twilight. And it’s not like a horror move preview. It’s more like a collection of documents: journals, letters, and records written by doctors, lawyers, and secretaries. Good pitted against evil, with some really interesting (I would argue good, I think) religious themes. The characters exhibit trust in a sovereign God, who is able to both protect them and defeat the evil they’re fighting. There are times when it is dark, so if you mind being nervous and a little scared, don’t read it. But if you like well-written, intense books with deep themes to discuss with friends – this book is high on my list. I’m still surprised. The Scarlet Pimpernel, by Baroness Orczy. This book has been one of my very favorites for years, and I am just finishing it for the millionth time. If you like history, romance, mystery, or surprises, you must read this. It’s about an Englishman who rescues aristocrats from Paris during the French Revolution. It’s amazing. The Fault In Our Stars, by John Green. I know what you’re thinking, and yes I did just write about how much I didn’t like this book. But nonetheless, it’s one of the best new books I’ve read for a long time and you should probably read it. I’ve actually read it twice in the last three months. There are several that I’ve missed, I’m sure, but this will do for now. I hope that if you read these you enjoy them as much as I have! Let me know what you think. “Thank God that his way of salvation is so utterly and entirely different from ours. Human wisdom and science postulate ability in our effort and seeking and searching and striving. But what does the gospel demand of us? Simply that we know that we are paupers, simply that we repent and admit and confess that we have nothing at all, that we are blind and lost and damned and hopeless and helpless. Oh, the tragedy that men and women should object to the most glorious thing about the gospel, that it is ‘the power of God unto salvation’ (Rom. 1:16) and not the power of man. Because it is the power of God, there is hope for all of us. I’m praising God for his perfect plan of salvation. His thoughts are too wonderful for me.